With a few years of Halloween parties under my belt there are certain go to foods that I tend to repeat over and over because they are pretty simple to create and tend to be great accents to fill out the buffet table. So I figured this would be a perfect time to share my absolute favorites. Cold Cut Head: This is one I get asked about a lot. It couldn't be more simple to make. 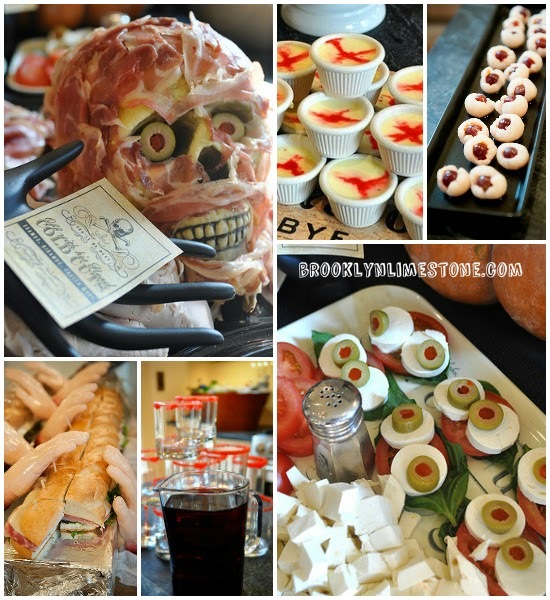 Just cover a Halloween skull in prosciutto(it sticks all on its own) and then use pimento olives for the eyes. Instantly terrifying. Panna Clotta: This is a great one to make ahead of time. Simple make a batch of panna cotta (or pudding or custard), poor into small ramekins and add a drop of red food coloring while still warm. Use a tooth pick to pull the red food coloring into a clot shape and then let cool. Added bonus: its very tasty. Moist Eyeballs: Pitted lychees (from a jar) with a grape inserted into the center and then scattered haphazardly on a black plate makes a striking addition to your display. Not only is it gross but a healthy treat. Give it a hand: Ok, so this isn't technically a food but simply adding dollar store hands to your finger foods takes 3 seconds and makes for a great impact. Blood Rimmed Punch: You can make virtually any punch recipe dark by adding some black food coloring. Add a red sugar rim to your glasses for extra effect. Eyeball Caprese: This one always gets eaten first. Take a mozzarella ball and slice in half. Lay halves side by side on basil leaf and top with sliced pimento olives. Here's looking at you! Need some label help? Grab my free skull printable labels. Hope this helps you prep for all of your haunts! What are your favorite Halloween foods? OMGoodness!!! That is so amazing! I love these! I've made a watermelon brain (time consuming, but very cool looking) and tombstone cupcakes (more cute than creepy). I'm trying to think of something for the Walking Dead premiere this weekend. Maybe the proscuitto skull!